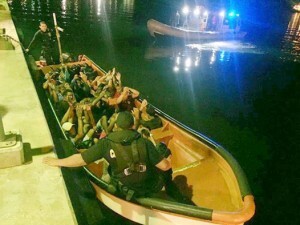 WILLEMSTAD - The Caribbean Coastguard (KWCarib) on Saturday intercepted a boat with twenty-two Venezuelans. The unlit boat was located near the Spaanse Water on the east side of the island. There, and from Caracas Bay all the way to Mambo Beach, more Venezuelan refugees are still trying to come ashore. The radar operator of the Rescue and Coordination Centre (RCC) of the Coast Guard detected suspicious movements south of Curaçao last Saturday. Then a Coast Guard vessel was dispatched to investigate. Near the Spaanse Water, the team found an unlit vessel. When the Coast Guard had approached the boat, twenty men and two women raised their arms in the air. The boat was towed to the Coast Guard jetty where the passengers were transferred to the police. Upon inspection of the vessel. the officers found a firearm. This was confiscated. The Venezuelans were transferred after interrogation to be deported back to their country. If it appears that one of them can be classified as either master organizer or captain, he will be charged with human smuggling.